As one of the almost popular Scandinavian countries to visit, Denmark’s tourism figures continue to soar every year. The country’s national tourism board predicts that visitor numbers will increase by 4% annually, with up to 27.7 million holiday makers expected in 2019. If you want to see Denmark’s beautiful countryside and vibrant cities, you’ll need information on currency exchange rates, ATMs and the best banks to use to make the most of your stay. Whether it’s a city break or a season long adventure, check out this handy guide to help you make the most of this up-and-coming Scandinavian gem. 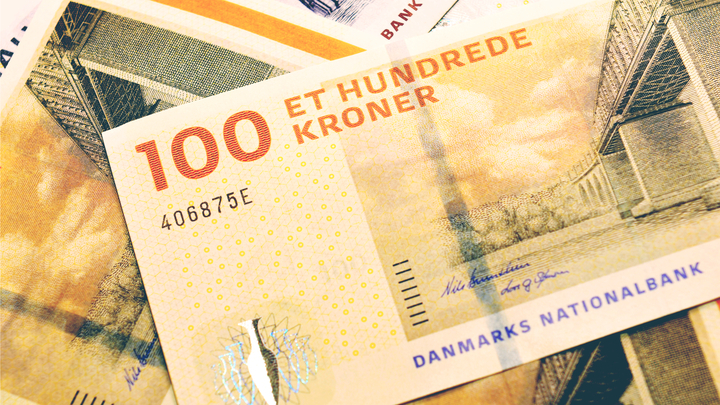 The official currency of Denmark is the Denmark Kroner (DKK) and has been the country’s official currency since 1875. While the Krone is officially the currency of Denmark, it’s also used in the Faroe Islands and Greenland. The DKK is available in both coins and banknotes. Bills start at 50 kroner and go up to 1000 DKK, with 100 DKK, 200 DKK and 500 DKK banknotes in between. Coins are available in 1-kr, 2-kr, 5-kr, 10-kr, and 20-kr. As a point of reference, a standard 3-course meal will cost you around 200 DKK. Denmark is considered fairly expensive as far as European countries go. A 25% consumer sales tax is applied to purchases which, by law, have to be displayed as part of the selling price. This means you shouldn’t be caught short when you get to the bill, but do expect almost everything to be more expensive than you’d usually pay. While the official currency of Denmark is the Kroner, many vendors – especially in larger towns and cities - will accept payments in Euros. However, they aren’t legally obliged to do so. Make sure you have plenty of Kroner in your wallet to be on the safe side. It’s also possible that you will be given change in Kroner if you use Euros, leaving you with an unfavourable exchange rate on all that spare change. It’s tempting to buy your DKK at home before your travel, and it’s certainly worth making sure you have some money on you as you make your journey. However, some of the best exchange rates can be found at your destination, so don’t change up all your spending money until you get to Denmark itself. It’s worth noting that many banks and exchange offices aren’t open on weekends – even in big cities – so make sure you have enough cash to tide you over until a weekday. There are lots of vendors where you can exchange cash in U.S. Dollars, Euros or Pounds Sterling in Denmark. Airport vendors are probably the worst places to exchange money, with unfavourable exchange rates and fees. Charges are usually included in the exchange rate, so don’t be fooled by any ‘Zero Commission’ claims. If you’ve arrived on a weekend only to find that all other currency vendors are closed, get only a small amount exchanged at the airport and find a better deal somewhere else. ATMs are a good place to withdraw cash at a reasonable rate, though some banks may add a fee. They’re widely available in nearly all Danish towns and are available day and night, seven days a week. Make sure that you know the mid-market rate before you get to Denmark so that you can ensure the exchange rate you receive is fair. The mid-market rate is the real exchange rate, which includes no mark-up or commission. It’s considered the fairest exchange rate possible and is sometimes referred to as the interbank rate. It’s the rate banks use to change money between themselves on the global financial markets. Hotel currency offices are similar to airport vendors and the many small currency exchange offices dotted round Denmark: expensive. Yes, they may be convenient, but you’ll be charged a premium for the privilege, either through commission or unfavourable exchange rates. Also, never buy money from currency bureaus . The rate may sound too good to be true and that’s because it probably is. Avoid scams by heading to a reputable vendor or ATM. Traveller’s checks are slowly becoming obsolete and you may have a hard time trying to find anyone to accept them in Denmark. They have been largely replaced by pre-paid currency cards, credit cards or cash as the preferred way to pay. You may be lucky enough to find vendors that accept Traveller’s Checks - the local Tourist Information Office may be able to help you out here. However, it’s unlikely that the exchange rate will be as favourable as you would get using your credit card at an ATM. Denmark has its own special laws on credit card spending, and foreign credit card users will routinely pay a surcharge on purchases. This could mean up to 3% extra being added on tp your spending. Credit card usage is convenient though and is widely accepted throughout the country. Visa and Mastercard are the most commonly used, although American Express and Diner’s Club cards are sometimes accepted too. Make sure you have photo ID when using your cards, as you may be asked to prove your identity. A pin code will usually be required to make credit card purchases, so be prepared and make sure you have a chip and pin facility. To get the most favourable exchange rate n Denmark, withdrawing cash from an ATM or your credit card provider is usually your best option. The ATM might ask you if you would like to withdraw money in your local currency. Don’t. Always select to be charged in the local currency of the country you are visiting (in this case Kroner). Being charged in kroner means your home bank will choose the exchange rate for your withdrawal. It‘s very likely to be more favourable than the rate that the local ATM provides. Speak to your local bank before travelling to see if they have foreign branches in Denmark, or any partnerships with Danish banks. They may be able to advise on ATMs where their customers get better rates or waived fees. If you need to send money to Denmark or back home, and want an even better deal for transferring money abroad, choose TransferWise. Whether you’ve just opened a bank account in Denmark or have friends or family living there, you can transfer money between accounts using the real mid-market exchange rate you find on google. Not only that, but your money is sent locally in both Denmark and your home country, which also cuts out on nasty international transfer fees giving you more money in the end.